Play today and you could win a new limited edition Classic 500 ‘Pegasus’ worth £4,999, kindly donated by Royal Enfield. With a strictly limited edition of 1000 globally, only 190 units are available in the UK. They are expected to sell out within days so this could be your last chance to own one. 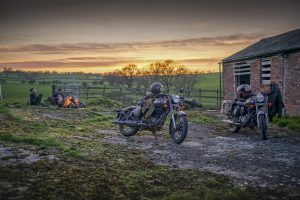 Royal Enfield, the oldest motorcycle brand in continuous production, launches the Classic 500 ‘Pegasus’ limited edition motorcycle on 1 July, inspired by the legendary RE/WD Flying Flea 125 motorcycle manufactured at Royal Enfield’s underground facility in Westwood, UK, during World War Two. The rugged Flying Flea saw service at D-Day and the airborne operations at Arnhem. This is your chance to own a piece of motorcycle and military history. Not only will you have the chance to win this amazing motorcycle, but every £2 raffle ticket will go to support our serving soldiers and families and those members and families of The Parachute Regiment affected either physically, or psychologically by recent conflicts in Afghanistan and Iraq. The draw for this Classic 500 Pegasus will take place on Friday 21 September 2018, as we commemorate the 74th anniversary of the Battle of Arnhem 1944. The oldest motorcycle brand in continuous production, Royal Enfield made its first motorcycle in 1901. 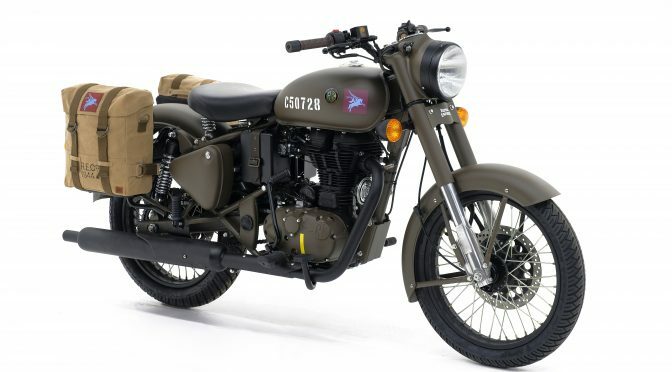 A division of Eicher Motors Limited, Royal Enfield has created the mid-sized motorcycle segment in India with its unique and distinctive modern classic bikes. With its new manufacturing base in Chennai, India, Royal Enfield is able to grow its production rapidly against a surge in demand for its motorcycles. With more than 50% growth every year for the last 5 years, Royal Enfield is fast becoming a very important player in the global mid-size motorcycle market and is working towards re-inventing this space with motorcycles that are evocative and engaging and great fun to ride. Royal Enfield’s product line‐up in India includes the Bullet, Classic and Thunderbird models in 350 and 500cc displacement along with Continental GT 535cc café racer and the purpose-built Himalayan powered by the new LS410 engine. Royal Enfield operates through 17 company-operated stores and 705+ dealers in all major cities and towns in India, and exports to over 50 countries across the world including the USA, UK, several European and Latin American countries, as well as the Middle East and South-East Asia. Royal Enfield also organizes and supports many motorcycling events and rides globally, more prominently the Rider Mania – an annual gathering of Royal Enfield riders from all over the world to the lovely beaches of Goa, and the Himalayan Odyssey, the most arduous motorcycle ride over some of the toughest roads and highest mountain passes in the Himalayas. Royal Enfield also conducts the popular ‘One Ride’ where people around the world ride out on their motorcycles on the first Sunday of April.